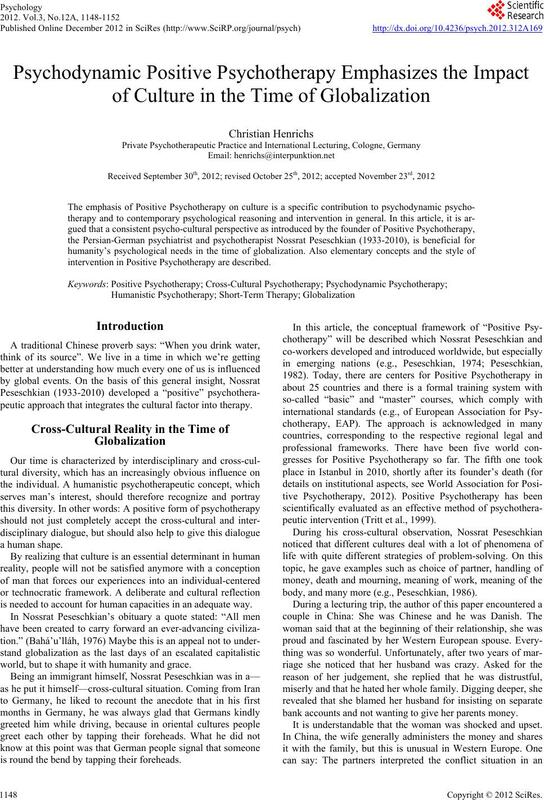 intervention in Positive Psychotherapy are described. 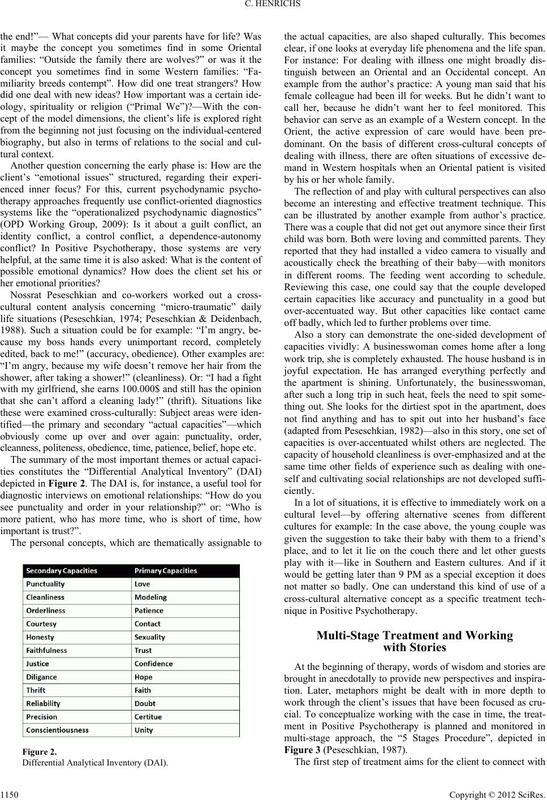 peutic approach that integrates the cultural factor into therapy. is needed to account for human capacities in an adequate way. world, but to shape it with humanity and grace. is round the bend by tapping their foreheads. peutic intervention (Tritt et al., 1999). body, and many more (e.g., Peseschkian, 1986). bank accounts and not wanting to give her parents money. It is understandable that the woman was shocked and upset. Culturally shaped concepts frequently appear in sayings. provide valuable access to the client’s inner world. stories or words of wisdom. against prevailing circumstances, in a subtle anarchic way. enhancing the interpersonal contact at the same time. to placebo effects or elements like social demographic fitting. of hope in the darkness of crisis. “actual capacities” and “step-by-step treatment strategy”. “I”, the “You”, the “We” and the “Primal We” (life itself)? family take a stand as a whole? Was there a family system? uncles? Was your family integrated in neighborhood (“We”)? cleanness, politeness, obedience, time, patience, belief, hope etc. clear, if one looks at everyday life phenomena and the life span. by his or her whole family. can be illustrated by another example from author’s practice. in different rooms. The feeding went according to schedule. off badly, which led to further problems over time. Multi-Stage procedure in positive psychotherapy. might reach this goal through self-observation or a pain diary. nance and a new perspective. showing his love to him. on his own development—and now actual therapy could start. cal boundaries for the benefit of a more pragmatic approach. equally by both, therapist and client, towards action orientation. inclusion of the partner and family (stage of “verbalization”). three to five years (stage of “goal broadening”)? more and more state of the art (e.g., Wöller & Kruse, 2010). dressing problems, but also addressing capacities to solve them. mirroring this enabling basic attitude. of time. “In depression, the future becomes a copy of the past”. 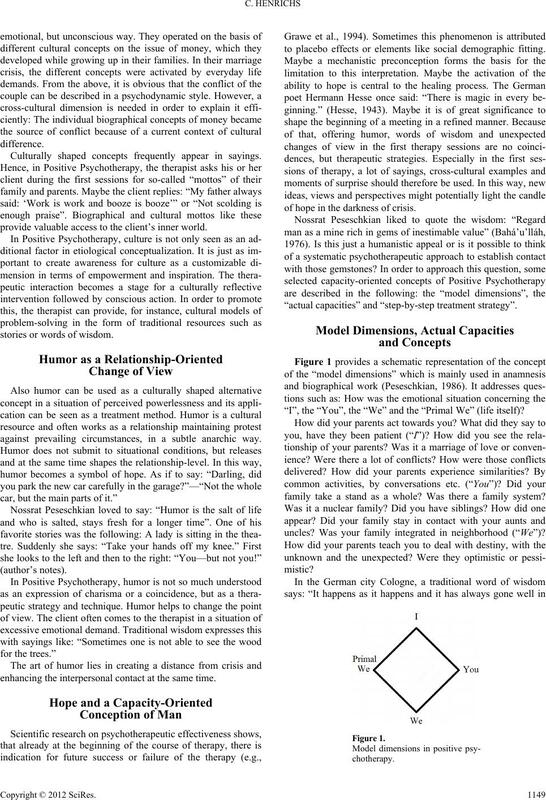 the possibilities in the future” (Peseschkian, 2006). mette, IL: Baháí Publishing Trust. technology. New York: Harper & Row. Hesse, H. (1943). The glass b ea d g ame. Oxford: Owl Books. world order. New York: Simon an d Schuster. Margraf, J. (Ed.) (2008). Lehrbuch der verhaltenstherapie, band 1. 2.
mische Diagnostik OPD-2. Bern: Huber Publishers. Peseschkian, N. (1986). 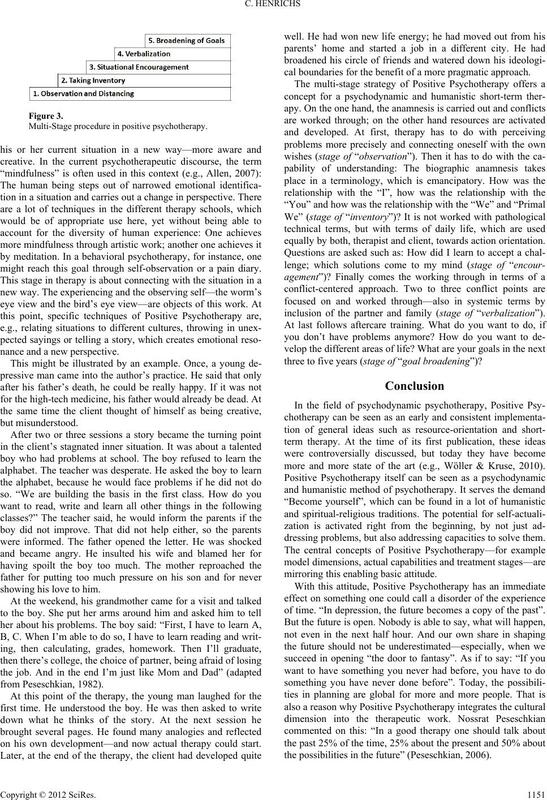 Positive family therapy: The family as therapist. a new method. Berlin, N ew York: Springer Verlag. something you never did. New Delhi: Sterling Publishers. therapy, Counseling & Healh, 1, 93-104. Consulting and Clinical Psychology, 51, 53.
chotherapy. Baltimore, MD: John Hopkins University Press. Tritt, K., Loew, T. H., Meyer, M., Werner, B., & Peseschkian, N.
approach. 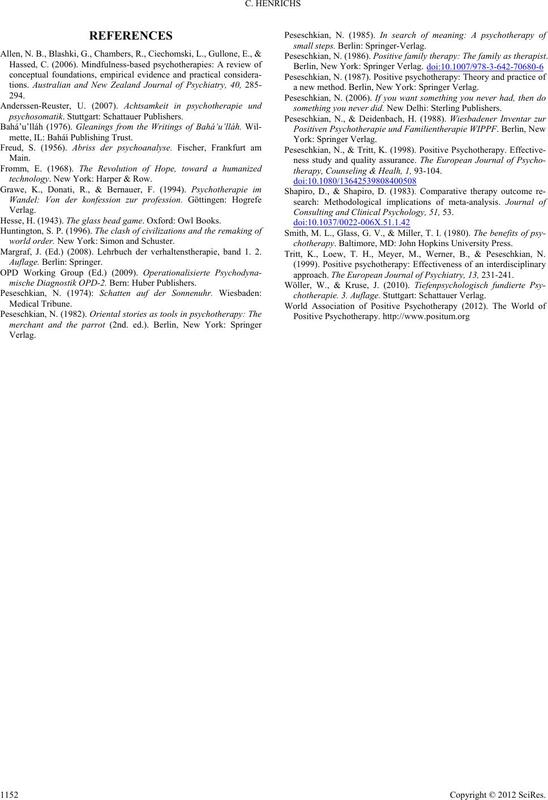 The European Journal of Psychiatry, 13, 231-241.
chotherapie. 3. Auflage. Stuttgart: Schattauer Verlag.